LET'S START BY STATING THE OBVIOUS: NIGERIA ARE NOT THE FAVOURITES in our qualifying group for the 2018 FIFA World Cup in Russia. That advantage (and the accompanying pressure) is held firmly by Algeria. Cameroun and Nigeria are neck and neck behind while Zambia are a further step behind in the pecking order. 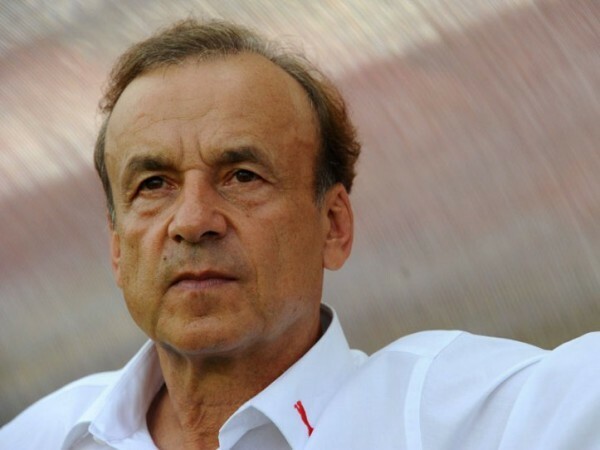 But if Super Eagles' new German coach, Gernot Rorh, grasps a good understanding of his team's strengths quickly enough; and he's able to come up with tactics that fully exploit those strengths, with a little luck, Nigeria are capable of nicking the sole World Cup ticket in Africa's Group of Death. Having been away for some time, it's too late for this column to interrogate the merits or demerits of Rorh's appointment by the Nigeria Football Federation (NFF) because the matter is already a fait accompli. Also, I would have loved to know where his reported $47,000 monthly salary (that is quite hefty, if you ask me) is coming from since the NFF say they're cash-strapped. I hear that the sponsor that is picking up the wage bill insisted on confidentiality, so we have to take the NFF's word for it that the arrangement amongst all the parties is well secured. Let's hope that Rorh's wages will never become an issue for national debate. Having said that, it's gratifying that Rorh got his tenure under way with a victory against Tanzania penultimate weekend in Uyo in our dead rubber 2017 AFCON qualifier. The Eagles missed a hatful of chances before Kelechi Iheanacho cracked home a beauty for a narrow 1-0 win. Not a bad start for Rorh, but the real work is just about to begin. Ahead of our opening 2018 World Cup qualifier against Zambia in a few weeks from now, I have a few suggestions for the German on how to achieve the objective of guiding the Super Eagles to Russia. A quick overview of the teams in our group of four former African champions will be followed immediately by my tips for Rorh. The Desert Foxes are the strongest team in Africa at the moment and this is buttressed by their position as the top-ranked African team in the monthly FIFA rankings. While the Eagles were struggling to beat Tanzania 1-0, the Algerians were putting six past Ethiopia en route to completing a 25-goal haul in AFCON 2017 qualifying. They are truly on a hot streak. But even before now, Algeria have always been a tough customer for Nigeria because of their superior technique and greater tactical awareness. Algeria knocked us out of the 1982 World Cup race, just months after we beat them 3-0 in the final of the 1980 Africa Cup of Nations (AFCON). They also won their only African title to date at Nigeria's expense in 1990. Historically, North African teams in general have always been a major problem for Nigerian and Sub-Saharan countries because, whereas our teams are quick to lose focus in the heat of battle, the Arabs, by virtue of their proximity and earlier exposure to European football, had imbibed the virtues of full concentration and tactical discipline. When they visit us with a defensive strategy, they easily achieve their minimum objective of an away draw or even steal a narrow win after frustrating us with their time-wasting tactics. (Zamalek repeated the trick against Enyimba again earlier this year in the CAF Champions League). It was when Sub-Saharan players mainly from Nigeria, Ghana, Cameroun and Ivory Coast became exposed to professional football in Europe that we began to close the tactical gap on the crafty North Africans. But they still continue to dominate African club football because most home-based Sub-Saharan players remain tactically naive as ever. Tips for Gernot Rorh: Against Algeria, the Super Eagles have their work cut out and must maintain 200 percent concentration from kick-off to the final whistle. We can't afford even a second of momentary lapse in concentration. With all due respect to our home-based players, I would think very hard before featuring them against Algeria, particularly in the defense. Their tactical awareness remains generally poor. The Indomitable Lions are Nigeria's nemesis in African football. But for them, we should be boasting at least five AFCON titles instead of three. Strangely, however, we have hardly met again in World Cup qualifiers since they eliminated us from the race to Italia '90. Until now. Cameroun are the most physical side in our group. And when Nigeria are the opponents, they play like they're literally at war. The way to stop the Lions is to outwit them because they're usually physically superior to our teams. At the 1984, 1988 and 2000 AFCON finals, they simply bullied their way to victory. We need very intelligent players to overcome the present Cameroun team who themselves are a bit short on confidence at the moment. The fact that we beat them 3-0 in our most recent friendly confrontation should give the Eagles a psychological edge. Tips for Gernot Rorh: Our confrontation with Cameroun will be less tactical and more physical. Prepare your team for a brutal game. Pick players who are ready for a street fight! A couple of tough home-based boys who are familiar with the difficult terrain of African football pitches will come in handy particularly when the Eagles go to Yaounde. The Chipolopolo are the most tricky team in our group and that probably makes them the most dangerous. The Golden Generation of the Super Eagles beat Zambia in the final of the 1994 AFCON, but it was not a stroll in the park. The Zambians are very quick and play the game at a quick pace, too. They do not have the experience or pedigree of Algeria, Cameroun and Nigeria who have all featured at several World Cups, but they can be a handful. They are clearly the group underdogs and have nothing to lose. Tips for Gernot Rorh: Don't hold the Eagles back with a defensive set-up in Ndola despite being an away ground. Go flat out for victory because this game offers Nigeria's best chance of an away win which will be crucial for qualification. Zambia also did not qualify for the 2017 AFCON, so they are not in their best form at the moment. Boosted by their home fans, they will definitely come all out for a win and open up the game. Nigeria must take full advantage and grab an important win. THE Super Eagles are unpredictable. When expectations are high, they often disappoint. And when you least expect anything tangible, they surprise you with some great play and some even greater result. The most recent evidence of this was their triumph at the 2013 AFCON in South Africa. No pundit gave coach Stephen Keshi (RIP) and his troops a dog's chance, but they brought home the trophy. As stated earlier, Nigeria are not the favourites in our World Cup group, so that is a good omen that our boys could spring another surprise. Beyond that, however, is what I consider also to be a very favourable fixture schedule for the Super Eagles. First is a trip to Ndola to face Zambia who, by my rating, are the "weakest strong team" (no contradiction) in the group. If truly we aspire to qualify for the World Cup, that is a must-win game, no question. Thereafter, we host Algeria and then Cameroun in our next two games. Again, those are must-win games because they are our main rivals and we must pick the full points when they come visiting. With a maximum nine points from our first three games, the Super Eagles will top the group table at the half-way stage and team confidence will get a boost. It will be difficult to stop Nigeria in subsequent games. Tips for Gernot Rorh: The major strengths of the Nigerian team are supreme athletic ability, natural ball skills, great speed and power. The players are individually skillful, strong and quick, but team work remains relatively weak. Exposure to Europe has brought some tactical awareness which was best demonstrated by the Super Eagles at USA '94 World Cup. But generally, the average home-grown Nigerian player is still not at the level of his average North African rival in tactical discipline. That is why you must work hard on achieving 200 per cent concentration and team cohesion. There's also something that we call the "Nigerian Spirit." It's an attitude of great resilience in the face of daunting odds. Now, this is something that Nigerian footballers have in abundance. But you have to win their absolute trust before they will turn it on for you. The most recent demonstration was by our U-23 team at the Rio Olympic Games where they overcame many odds to win a bronze medal because they trusted their coach, Samson Siasia. You (Mr. Rorh) don't have much time to bond with the players before the World Cup qualifiers kick off but, luckily for you, Mikel Obi who led the U-23 boys in Rio is also your captain in the Super Eagles. He will educate you on how to coax the unbeatable Nigerian spirit out of your team. And it could be the decisive factor to win the ticket to Russia 2018. Good luck, Mr. Rohr. FOOTNOTE: The Nigeria Football Federation (NFF) have a critical role to play if Gernot Rorh is to succeed. The logistics of team travel, accommodation and provisions for camp allowances and match bonuses should be resolved well ahead of time so that the players can concentrate fully when they report for each game. The task at hand is tough enough already. We mustn't compound it with avoidable distractions. Good luck, Nigeria. CALLING ON SPORT MINISTER SOLOMON DALUNG: ANY PROGRESS ON THE NIGERIA SPORT REFORM COMMITTEE REPORT? ATTENTION, SPORT MINISTER SOLOMON DALUNG: WHEN IS THE NATIONAL SPORTS COMMISSION MAKING A RETURN? Thanks Oga Mumini, hitting the bulls eyes as always. You have said it all. A word is enough for the wise and I hope Mr. Rorr is more than wisee to imbibe this 'epistle'. God bless you sir.